World Cup Of Pool's menu system is easy to navigate. To access the Single-Card Download play, players tap on "Start Game", "2 Players", "Wireless", "Host Game", and then "Download Play". The opening credits are practically non-existant. Download time is approximately one minute. The menu system itself is clearly labeled, all of the options make sense, and it can be navigated either by tapping or by using the Direction pad and buttons. The game forgoes "motion control" via the touch screen and instead uses the touch screen as a control panel. The result has players set aim direction, power level, and spin control, then tapping the "Play" button and watching their shot happen. This control scheme removes the possibility of hands "slipping" while aiming on the touch screen and the system not reading the intensity of the shot (its power) accurately. Some players may feel that it removes a sense of realism, but in truth, it makes the shots much closer to what they're intended to be. While the on-screen control panel is accurate, it isn't flawless, and will take some time to get used to both the spin controls and exactly how the different power levels affect shots. The most important feature not included is the ability to see the ball from eye level from any angle (the ability to "walk around the table" and check out all shot angles). Graphically, the game is simple, and doesn't need much more. The pool balls, however, can be very hard to distinguish (but in number and stripes/solids, as well as specific colors) without zooming in. The sound is primarily sound effect, which work well for setting the mood and letting a player know if a shot happened to graze another pool ball or if it just got close. The game's Single-Card Download functionality is lacking most in features, allowing for only one type of pool (8-ball), and having no selectable settings (number of players, game rules, table color, etc.) for the players to choose from. One of World Cup Of Pool's strong points is its control scheme. There's no more "Whoops!". The controls do take some getting used to, but players are left with the ability to take the shot they wanted to take every turn, even if it's not a very good decision (that fault, no game can fix). There are, as always, a number of things I'd change (see below), but overall, I found World Cup Of Pool to be a success (at least its Single-Card Download multiplayer). I wish the other types of pool (9-ball, etc.) were available, I wish you can play more than two players via Single-Card Download play, and I wish there were rules options that could be changed each play-through. What's there, though, works very well and didn't disappoint. I enjoyed playing it, and was surprised to discover that fact; most Nintendo DS "budget bin" titles aren't put together this well. Heck, some full-priced Nintendo DS titles aren't put together this well. I actually enjoyed playing the game, and know I'll do so again. 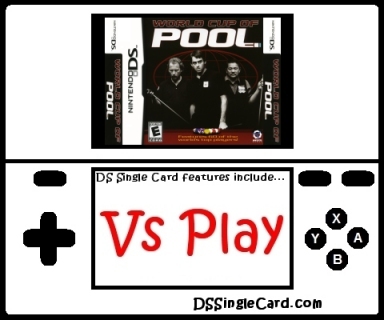 If you're looking for a game of pool for the Nintendo DS, you won't go wrong selecting World Cup Of Pool. I sincerely hop there's a Nintendo 3DS version coming at some point, with the added bonus of being able to "walk around the table" to view it from any angle/height. Until then, though, I'm keeping this one handy. Tighten up spin and power contrtols, possibly involving a zoom-in function when setting them, making them larger and increasing setting accuracy. Allow players to "walk around the table" and see it from any angle/height prior to shooting (would work well in 3D on the Nintendo 3DS). Increase the resolution/clarity of the pool balls. Make the other types of Pool available (9-ball, etc.) via Single-Card Download play. Permit players to select game rules, number of players (up to 4), table color, etc. Offer a downloadable Demo (multiplayer or practice mode).